Funeral Notes: Prayers and final viewing will begin at 8:45 a.m. on Monday morning at the Funeral Home. 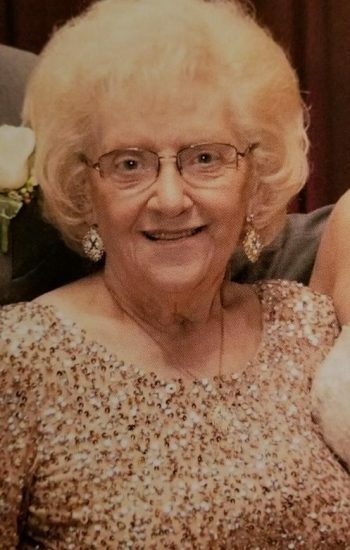 Jean M. Daciolas nee: Wieczorek; Beloved wife of the late John Richard Daciolas Sr.; Devoted mother of John Jr. (Mary), Barbara (Richele) Daciolas-Semon, James (Theresa), William (Mary Jane), Kenneth (Karen), Rick (Jennifer), Dave (Bobbi); Loving Grandma of Lauren, John, Charlotte, Michael, Jennifer, Michelle, Melissa, Rose, Billy, Brooke, Nick, Rick Jr., Rachel, Lily, Stella, Samantha and Jack; Devoted Great Grandma of Eve; Dear sister of Dorothy Niedbalec, Edward (Emily) Wieczorek and the late Eleanor Peterson. To a wonderful mother, aunt and grand mother. So proud to be part of your family. I wanted to express my deepest sympathies. Our parents have been next store neighbors for more than 50 years. I can’t think of my childhood without Mrs. Daciolas. You are all in my thoughts and prayers.